Gen Con 2018—the best four days in gaming—looms on the horizon, while beneath the sands of Egypt, something ancient stirs. That which has long slumbered has begun to awaken and now people live in fear that should they fall asleep, they may never awaken. 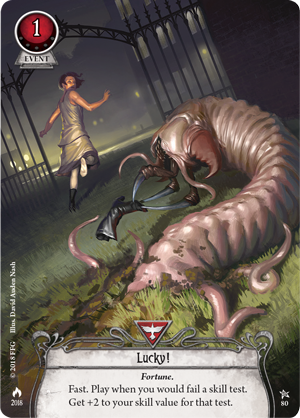 The investigators of Arkham Horror: The Card Game must gather to uncover the cause of this medical mystery, before the same ailment claims them and an unspeakable calamity falls upon the Earth. Today, we meet with Matt Newman to discuss The Eternal Slumber, the chilling nightmare that will take hold at Gen Con 2018 and continue through Arkham Nights 2018. You will be able to register for this bone-chilling event starting on May 6th on the official Gen Con 2018 website here! At Gen Con 2017, we held a special event for Arkham Horror: The Card Game. The Labyrinths of Lunacy was a unique twelve-player scenario in which up to three groups tested their wit and their will against a fiendish mastermind, and only the quickest and strongest survived. This event was also featured at Arkham Nights 2017 at the Fantasy Flight Games Center in Roseville, Minnesota. 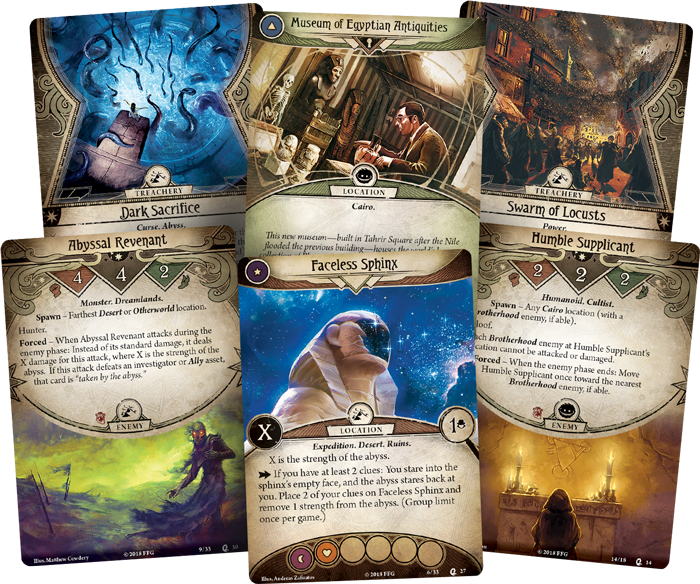 This year, we’re doing something a little different, and I’m here to introduce this year’s special events for Arkham Horror: The Card Game at Gen Con and Arkham Nights. 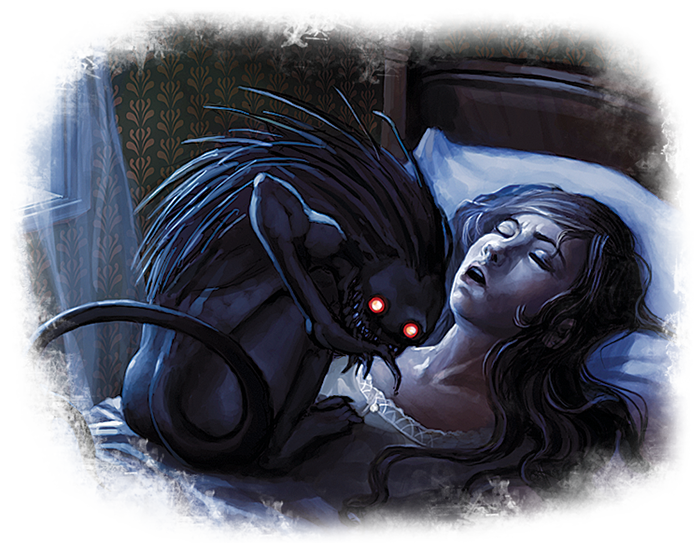 At Gen Con 2018, we’ll be running the unique scenario The Eternal Slumber, a one to four player scenario which can be played as a standalone scenario or integrated into any campaign as a side story, like our previous scenarios, Curse of the Rougarou and Carnevale of Horrors. The scenario will also be made available and sent out to participating retail stores in Invocation Kits this fall, before Arkham Nights 2018. 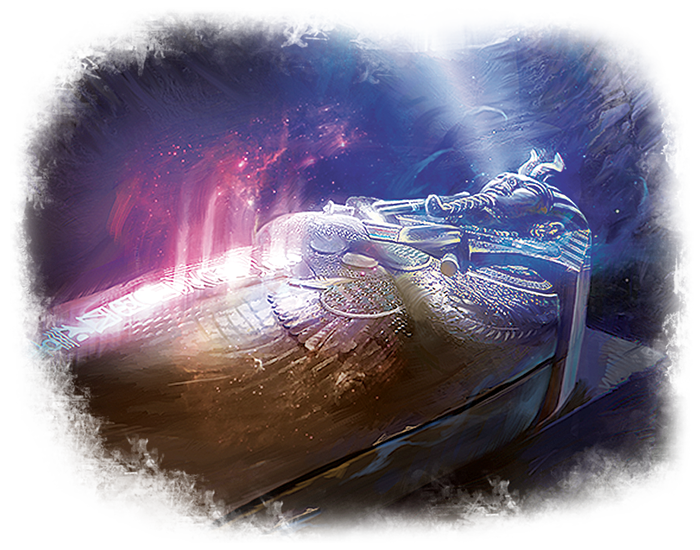 Each copy of The Eternal Slumber—both at Gen Con and in Invocation Kits—will come with an extended art promotional card, which will only be found in The Eternal Slumber. Something strange is happening in Cairo, Egypt. Seemingly random victims all throughout the city have fallen into comas, leaving doctors baffled. When Jessie Burke comes to you desperate for help, you find yourself obligated to assist, despite the risk that you may never again wake from a night of sleep. Your team of investigators must search throughout Cairo and the ruins of ancient Egypt to find a way to lift this curse… and in the process, unveil a sinister machination between two forces far beyond our comprehension. We will be recording the results of every playthrough of The Eternal Slumber at Gen Con 2018, and your choices and performance during the scenario will have lasting repercussions, not only for your play group, but for the entire Arkham Horror: The Card Game community at Arkham Nights 2018! At this year’s Arkham Nights event, we’ll be unveiling a second unique scenario titled The Night’s Usurper. Like the scenario at Gen Con, The Night’s Usurper is a standalone scenario that can be integrated into any campaign as a side story, and it also comes with an extended art promotional card, only available at Arkham Nights 2018. While this scenario is playable without having experienced The Eternal Slumber, it is the natural continuation of the story, wherein the performance of the players at Gen Con and the decisions made by the overall community will have a very real impact on whether or not the investigators at Arkham Nights succeed. But that’s not all—we’ll also be recording the results of every playthrough of The Night’s Usurper at Arkham Nights 2018, and the resolution acquired most often will have an impact on every Arkham Horror: The Card Game player around the world! Depending on the result at Arkham Nights, one of three different basic weaknesses will be included in a future product, with a nod to the events in The Night’s Usurper. You won’t get to see any of these weaknesses ahead of time, so you can only imagine what sorts of horrors they might entail. Even should you succeed in a scenario, you may be forever hunted by an Aspect of the Beast. Or perhaps you will find a way to spare yourself, but in the process make an Abyssal Covenant, subjecting every investigator to the detrimental (and permanent) consequences for your actions. But should you fail to stop the Day of Reckoning, you may truly be in dire straits, causing every investigator to be haunted by this powerful treachery. If you can’t make it to Gen Con or Arkham Nights this year, worry not. 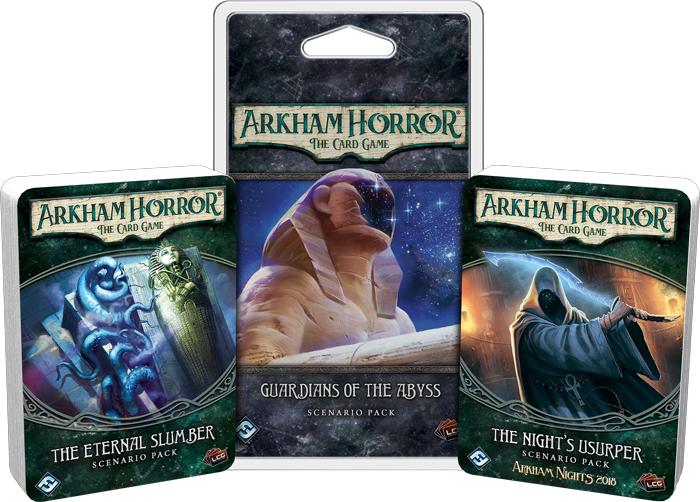 We'll be releasing both The Eternal Slumber and The Night’s Usurper in a separate retail package, titled Guardians of the Abyss. This 78-card pack will provide everything you need to run both of these scenarios in either standalone or campaign mode, allowing you to experience the same events that took place at Gen Con and Arkham Nights in the comfort of your own home, with the consequences of your actions in The Eternal Slumber carrying over into The Night’s Usurper. I hope you are as excited to experience these scenarios as I am! I’ll be watching from the sidelines, rooting for the mastermind’s schemes to come to fruition the investigators, of course. Pack your bags and mark your calendar! Registration for the first stretch of this unprecedented two-part campaign event begins on May 6th at 12:00 P.M. Eastern Time. 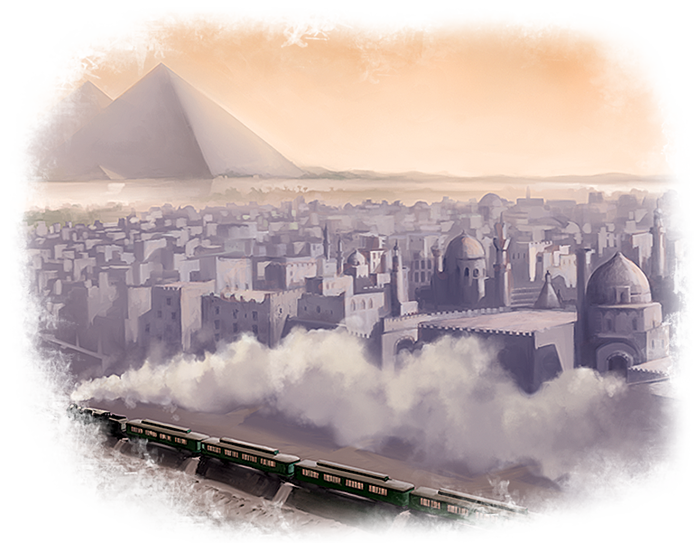 Experience the terror creeping beneath the sands of Egypt and make your mark on Arkham Horror: The Card Game! To join the investigation at Gen Con 2018, you can register to take part in The Eternal Slumber event here, beginning on May 6th!